and Public Works by Jacob Dekma titled "The Sand Hills." See the footnote below for more details. The asphalt road built across the Sand Hills in 1926 gave years of excellent service for 25 years. However, by the 1960s, the old 20' wide two lane road proved inadequate and a replacement was needed. 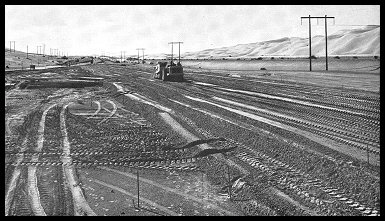 In 1961, construction started on a divided four lane highway through the dunes that became one of the first portions of US 80 to turn into I-8. Just as road building technology advanced between 1915 and 1926, it advanced just as much in the intervening years to 1961. Instead of being limited to constructing a narrow 20' wide road, a wide four lane divided highway with full 12' lanes could be put through. This difference is shown rather dramatically in the picture at right, which is facing east. The old route is the black line in the middle to background with the sharp turn in it. The modern road is shown under construction in the foreground, with a gentle turn into the old alignment in the top left. The All-American Canal is the thick line in the top left right under the mountains in the distant background. 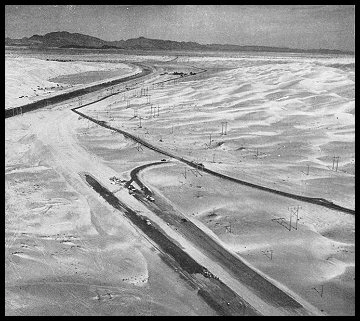 Right: Construction of the freeway near Gray's Well exit, 1961. If you have any questions, comments, or if you would like to send me any updates or pictures, please contact me at: casey@gbcnet.com.